This artwork “Community Spirit” made from handmade ceramic and mosaic is part of a public sculpture called the Federation Gateway Sculpture at the entrance to Balaklava a town in the Mid North, South Australia, here is a link if you want to take a look 109 Stories behind the Wall. 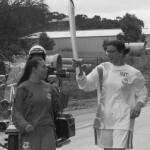 However this story is about the running lady in white on the left hand side holding the torch. As an artist you never know where the next idea for an artwork comes from and that makes my profession especially fun. Christina Angus is her name and she never ceases to amaze me because there is nothing that she cannot do, Christina is one of these “can do” people, whatever you ask her to do, she will fix it, do it and sort it. There is no mountain too high and no river too deep for her, no siree! Well that’s not that unusual you may say; there are lots of amazing women out there doing lots of stuff. Yes and I agree so there is; however this amazing woman is legally blind and has only got 6% sight in one eye and nothing, zilch, nada in the other. If you think that’s going to stop her from getting on with it, you have another thing coming. So let me tell you about her list of achievements which just continue to grow as we speak and a list too long to describe here. 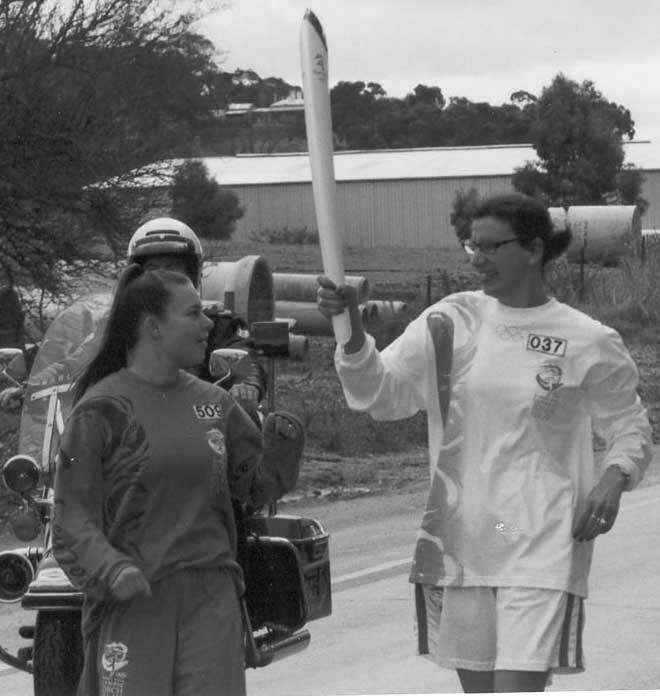 Let’s start with the Olympic Torch Relay depicted in my artwork, here she was chosen as an outstanding Community member for the Sydney 2000 Olympic summer games, to run part of the leg when the torch made its way through the Clare region in SA, cheered on by hundreds of local supporters. 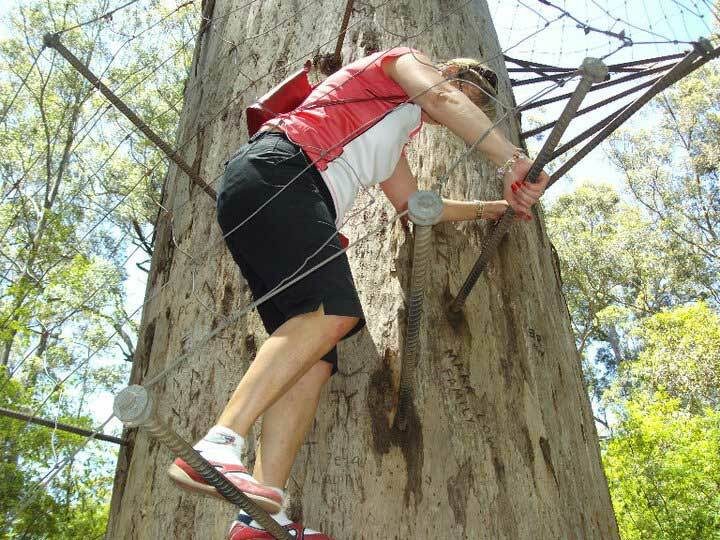 Then it was time to do the Kokoda track as part of a fundraiser for her employer the Guide Dogs SA&NT. She was joined by Cosi from Triple M and 14 other Australians and the whole thing was made into a documentary for Chanel 9 by Troy Gray. The Kokoda track is one of the most challenging treks in the world and spans 96km between the northern and southern coast of Papua New Guinea. Many soldiers lost their lives there during the war fighting the Japanese and the unforgiving Kokoda trail has also claimed 8 Australian lives trekking in peace time. In 2010 Christina set off for Italy and trekking through the Dolomites followed by Cinque Terre where she and her husband took the walking trail between the 5 villages on the on the rugged coast of the Italian Riviera called Sentiero Azzurro. Not to mention she has also climbed both Uluru on 4 separate occasions as well as the Kings Canyon. At Christmas time this year Christina could be found 75 meters up a Karri tree in Pemberton in Western Australia, climbing up on metal spikes fastened into the tree trunk with no safety net. I have to point out she has to feel her way as she cannot even see her feet. If that wasn’t enough, Christina as the “stoker” and Andy Griffiths as the “pilot” just finished the Tour Down Under section called The Mutual Community Challenge and rode the 135km from Norwood – Strathalbyn on a tandem bike reaching speeds of 60km an hour. 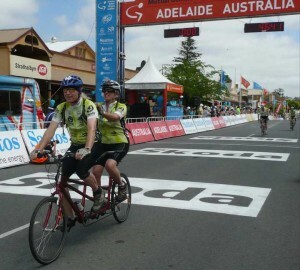 Move on over Lance Armstrong she is catching up! So I shouldn’t have been surprised when she jumped up on the one meter high and 50cm wide marble bar at her 50th birthday party held at The Banque and did a crazy go- go girl routine should I? The only problem being she threw the gauntlet and I, her best friend had to follow, right? Much to the horror of the bar staff who saw an accident waiting to happen (well we are talking past midnight and let’s just say I at least, was a little bit happy) but all is well that ends well and you only live once! I think the following quote fits rather nicely here said by the Rev. Dr. Martin Luther King, Jr.